Chris is one of the 2 cofounders of Vero. Vero allows you to send emails to prospects and customers based on what behaviours they have taken on your site and with your product. You have a membership site and there are 10 videos for people to watch. Suppose someone signs up and starts watching the videos. Unfortunately, their mom calls in the middle of video 5 and they close the browser to answer the phone. After talking with their mum for an hour, they’ve completely forgotten about your course. And maybe, in a few days, they decide to request a refund because well gosh, they never watched all the videos. With an application like Vero, you can send your customer an email a few hours after they leave to remind them to watch the rest of the videos. Is there a feature of your SaaS product that someone hasn’t used on their free trial? Automatically send them an email about it and increase the chances that they continue after the free trial finishes. Is there a page on your site (such as your testimonials) that you think people should see? Automatically send them an email if they haven’t visited it yet. 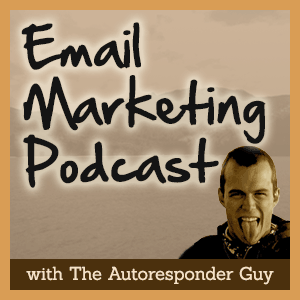 We’re standing at the beginning of an email marketing revolution. Sure, the big companies do it already. But do you think small to medium enterprises do this? They probably don’t even know about it. And if they do, they probably haven’t set it up because they’re confused. Now is your chance to get a huge advantage over your competition. will this make the average non-marketing person uncomfortable? does this only work for Saas and ecommerce businesses? or does it work for every type of business? Great Podcast today and never really thought of this outside of my ecommerce store. Thanks for answering the book question. I’m sure lots of people had that on their mind. Even better though is the copying copy tip. You say about an hour a day?